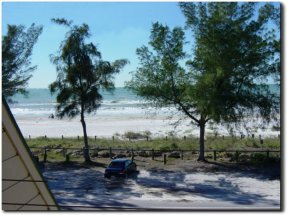 Our apartments are located in Bradenton Beach on Anna Maria Island lying on the crystal-clear, emerald waters of the Gulf of Mexico. Under an azure-blue sky you will find an invitation to discover the serenity of this unique, friendly and quiet barrier community. Completely remodelled on December 2002, our apartments (1,200 square feet each) offer a perfect setting for enjoying a special, unforgettable vacation on beautiful beaches and in a delightful climate. Completely remodelled on December 2002, our apartments (1,200 square feet each) offer a perfect setting for enjoying a special, unforgettable vacation on beautiful beaches and in a delightful climate. 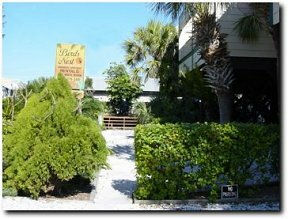 Our apartments are located in Bradenton Beach on Anna Maria Island lying on the crystal-clear, emerald waters of the Gulf of Mexico. Under an azure-blue sky you will find an invitation to discover the serenity of this unique, friendly and quiet barrier community. Our apartments are at a convenient distance from the most famous attraction at Orlando, Disney World, a two hour drive. Tampa's Bush Gardens & Adventure Island theme park is 45 minutes away, while Mote Marine Laboratories and the Pelican Man Sanctuary are a mere 10 minute ride. Sarasota-Bradenton Airport is only 20 minutes from our island. The Ringling Museum of Art is just across the bay, and the famous Sun'n Fun Aviation Museum and Airshow are 50 minutes away in Lakeland. Within comfortable walking distance you will find shops and a variety of restaurants which offer cuisine varying from the European to delightful local seafood served in a charming informal atmosphere. Our 2 bedroom units are arranged on two elevated levels for a total of 1,200 square feet each unit. The lower level embraces one bedroom, a private bath containing tub and shower, and an equally private balcony. Also on the lower level are found a living-room, opening onto another balcony with a dominating, spectacular view of the Gulf of Mexico. These units also have a fully-equipped kitchen and dining area. Two apartments have wood floors and two are carpeted. All the apartments have, in kitchen and baths, Italian tiles. The kitchen is furnished with a washer and dryer, trash-compactor, cutlery and dishes, dishwasher, full size microwave, range glass cook-top and oven, refrigerator with icemaker and smoke alarm. The entire second level is comprised of the master bedroom with a kingsize bed, its own bathroom and a huge walk-in closet. From the master bedroom gorgeous views of the Gulf through full length glass windows, and at the opposite end, a secluded, wide porch overlooking magnificent Sarasota Bay. Each apartment is beautifully decorated and fully furnished. • SAT - SAT only. Check in 2 p.m. Check out 11 a.m. Early check ins or late check outs require prior approval.